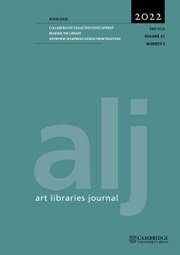 Published quarterly since 1976, the Art Libraries Journal is the main international forum of the art library profession worldwide, with contributions from key specialists in art librarianship and the management of visual resources, and also from archivists and museum curators. The Journal covers the role of art libraries today, from the impacts on art documentation of a changing research environment, the internet and digital technologies, to themed issues about artists, books, ephemera and online repositories. What is critical about critical librarianship?